The 37 metre motor yacht Fiorente has been listed for sale by Gergory Gheraia at BlackOrange Yachts. Designed by Studio Peterlin, Fiorente was built in steel and aluminium by Italian yard Ferronavale to Lloyds class and delivered in 1990. An interior by the late Luca Dini, using warm wooden joinery and contemporary fabrics, accommodates 10 guests in five cabins consisting of a master suite, two doubles and two twins, all with entertainment centres, Sony slim line television screens and en suite bathroom facilities. 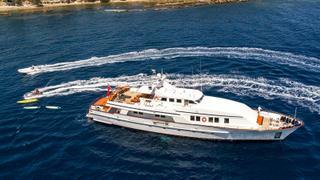 An additional three cabins sleep up to seven crew aboard this yacht for sale. A three-year €4.4 million refit from 2014 to 2017 saw Fiorente receive brand new engines, new generators, new shafts and propellers, at-anchor stabilisers, upgraded electronics and a 25 years Lloyds commercial survey was completed. The main deck saloon has comfortable seating on cream upholstered settees in a U-shaped configuration around a large coffee table and there is an entertainment centre including a 46 inch Bang & Olufsen television screen and a stereo surround sound system. Forward is a formal dining area with seating for eight guests. A popular charter yacht, she has ample outdoor spaces including an aft deck with al fresco dining amenities for 12 guests while up on the sun deck there is more dining available under the stars and she has been known to entertain 50 guests at the quayside during event charters. Twin 500hp Scania diesel engines and 32,000 litre fuel tanks give her a range of 2,800 miles at her cruising speed of 12 knots. Available to view during the Cannes Yachting Festival, Fiorente is asking €5,900,000 with VAT paid.